The Fox agitprop message was set immediately with the chyron, "Class Room, Class Warfare, VA 3rd Graders Perform Ode to Occupy." Doocy read some of the subversive lyrics to the song. In keeping with the meme, set by MacCallum, Doocy asked if it was believable that 3rd graders would be able to compose these lyrics without help from teachers which, as noted by Doocy, is what the school is saying. (And we can't believe that, can we?) He introduced his guest, Kyle Olson, who "isn't buying it." The question is raised as to whether we can "buy" what Fox "friend" Olson is saying given that Olson is a right wing ideologue who attacks teachers' unions and has written a book about public school indoctrination. The Fox message, that the school is not to be believed, was advanced with Olson's "joke" that 3rd graders know more about bath bubbles than they do housing bubbles. 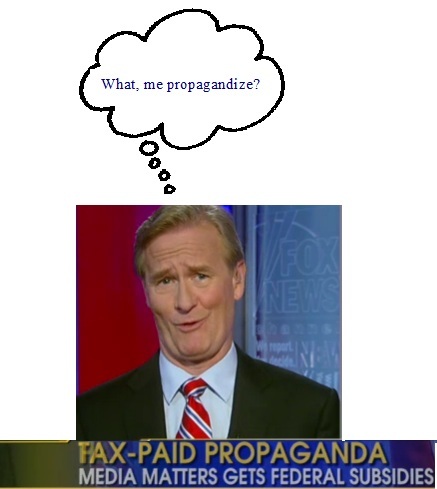 Doocy, who lives in a right wing bubble, giggled hysterically at that one. Olson and Doocy, whose kids probably haven't had to deal with issues like parent's job loss or home foreclosure, still couldn't believe that these kids knew anything about income inequality. Obviously, In order to elicit the requisite agitprop, he asked Olson to discuss the group that helped the students. Cue the agitprop. Not surprisingly, Olson said that while the Kid Pan Alley claims to be apolitical, he found an example of their librul/commie/pinko propaganda in a song that their students wrote about the Obama inauguration. Doocy did more giggling as Olson said that the kids wrote "hip, hip, hooray, Obama is going to save the day." Olson referred viewers to his article on theright wingTown Hall website. Olson claimed that Kid Pan Alley is engaged in a "disturbing pattern" which the state and parents need to examine. To Doocy's question of "the parents stood up and did what," Olson answered that the school admitted "that they did wrong." (Actually, they didn't. They said that they have confidence in Kid Pan Alley which has pledged to be more sensitive) because a parent said "this isn't right." (Oh, wait a minute, on Fox & Friends when one secular parent speaks out about church/state violations, they are accused of causing trouble). Olson urged parents to speak out against this indoctrination and say "we need to get this out of our schools. Doocy claimed that a parent's protest has "put an end to this." Olson and Doocy are either misinformed or lying because there haven't been any protests from parents. The only complaint was from a teabagger who doesn't appear to be a parent. So if these kids composed a hymn to St. Ronald Reagan, do ya think that Doocy and Olson would be as concerned? As far as indoctrination, one has only to watch Fox & Friends to see it in action. Taking responsibility for the lyrics does NOT mean that Kid Pan Alley wrote them. Now, would you like to retract your comment, or just leave it as is, as a monument to your apparent reading comprehension problem? In a phone interview with The Daily Progress, Rogers said that Kid Pan Alley has not codified the clarification, and may never do so. ‘We have not codified that as of yet, and itâs not out of the question that we wonât. What we have done is talked about it in full at the board meeting,’ Rogers said. She added that future songwriting facilitators will be trained to steer students away from controversial content." The point, other than that which sits atop your cranium, is that Fox & Friends was using this song as an example of so called liberal indoctrination in the schools when it appears to be nothing of the sort. Fox is also suggesting that the kids were coached and there is no evidence to suggest that. All Kid Pan Alley said was that they will try to steer clear of politics in the future. They made no comment regarding this song other to say that when it was composed the Occupy movement was not the “hot button issue” that it is today. As seen by Fox “coverage,” it’s Fox “News” that is making a right wing “hot button issue” of this when none is warranted.